Beyond Salmon: Does resting meat help reabsorb the juice? Does resting meat help reabsorb the juice? There is no shortage of best practices when it comes to meat juiciness. Sear the meat to seal in the juices was one advice considered to be sound for over 100 years. 19th century cooks including August Escoffier believed it to be true. Most professional chefs and food writers now laugh at this myth. There are plenty of wonderful reasons to sear meat. It tastes much more complex and crisp when browned, but as far as juices go, searing doesn't help. How about the second best practice to optimize juiciness -- let meat rest after cooking to minimize the amount of liquid the meat loses during carving? You can read about it on page 165 of "On Food and Cooking" by Harold McGee. Kenji Alt set up an experiment in 2009 to test this idea, which lead him to agree with McGee. I realize that arguing with Harold McGee in the 21th century is like arguing with Escoffier in the 19th. But I couldn't help wanting to test this juice theory for myself and decided to set up an experiment that was similar to Kenji's. I cooked 4 steaks. All 4 were 1 inch thick and cut from the sirloin. No salt was used. All steaks were cooked in a hot skillet. This is not how I normally cook steak, but that's how Kenji cooked them for his experiment. I flipped the steaks 3 times to help them cook more evenly. I cooked until the internal temperature registered 120F. I weighed the steaks as they came out of the skillet and assigned them to trail 1 or 2 based on their shape. Since steaks A and B had similar weight and shape, I assigned them to the first trial and steak C and D to the second trial. I cut one steak in each trial (A and C) immediately in half and let them rest 12 minutes. I let steaks B and D rest for 12 minutes and then cut them in half. All steaks were sitting on plates so that I could collect their juice. I poured the juice off each plate and weighed it. Here is a chart with the weight of the juice recorded as percentage of the weight of steak as it came out of the skillet. 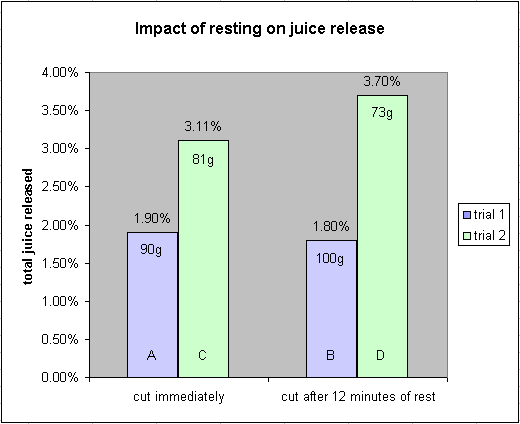 Whether the steak was cut and then sat for 12 minutes or sat for 12 minutes and then was cut didn't seem to make a difference in the amount of juice it released. Why did trial 2 steaks release more juice than trial 1? My guess is that steaks C and D had a higher average temperature -- they looked more done. The more the temperature of the meat exceeds 120F, the more juice muscle fibers release. Although I was aiming for the same doneness in all steaks, and removed them off the skillet when the minimum internal temperature was about 120F, the tapered shape of the steaks C and D (trial 2) probably caused their average temperature to be higher than the average temperature of the steaks A and B (trial 1). Does this mean you don't need to rest your meat? It depends on how you are cooking it. With all traditional methods, you still need to rest it so that the temperature can come to equilibrium. All proteins have their ideal doneness temperature (the point at which they are most tender and juicy). When you remove your protein from the heat source, the temperature in the outer layers is higher than ideal and the temperature in the center is lower than ideal. As the protein rests, the outer layer raises the temperature in the center to the ideal temperature (assuming you did everything correctly), and then the whole thing starts to cool off. This is known as carry-over cooking or residual heat. How much residual heat you'll get depends on many factors that I covered in this post (scroll to the end of it). What if you cook your meat using the sous-vide method? Should you still let your meat rest? In theory, your center is already at a perfect temperature. I found that searing might bring it up a few degrees depending on the shape of your steak, but this is small potatoes compared to carry-over cooking that happens using traditional methods. So if you are really hungry, dig right in. Since the experiment I was trying to reproduce was Kenji's, it's worth to compare our findings. According to Kenji, cutting a steak after 12 minutes of rest can keep 7%* more juice inside the steak than cutting it right away. My results were very different. I found that how long you waited before you cut the steak didn't matter. Of course, our experimental set ups might have been different. And neither one of us did enough trials to give our results any statistical significance. If someone wants to sponsor a serious steak juiciness study, I'd be more than happy to undertake this project. I also must disagree with Kenji's graph of internal temperature after cooking (see the end of this post). According to his graph, the internal temperature holds at 125 and then goes down. I've never been able to reproduce this. Every time I cook meat via a high-heat method, I always observe an increase in internal temperature during resting. For more details see the end of my Roast Chicken Legs post. * Since Kenji used raw steak weight as 100% and I used cooked steak weight as 100%, his 7% juice release difference would be more like 6% juice release difference assuming steak loses 13% of its weight during cooking. Have you weighed the liquid? I'm wondering whether the liquid released prior to resting might have a difference in the fat/water ratio. So it might weigh slightly more. Or I could be wrong. I sliced 2 steaks right out of the skillet and sliced the other 2 steaks after 12 minute rest. all steaks (cut and uncut sat on plates for 12 minutes after coming out of the skillet). Then I poured off their juice and weight it. I did not measure what percentage of juice was water and what percentage was fat. That would depend on many factors including the fattiness of the steak. I am not sure what you mean by the liquid released prior to resting. Do you mean the liquid released during cooking? There is definitely a good bit of weigh loss during cooking -- both water and fat. I can't think of a good way to measure how much of it is water and how much is fat. But I don't think the composition of juice is particularly relevant to my experiment. All I wanted to know was whether steak cut after resting was release less juice than the steak cut right out of the skillet.